It’s tournament season. From high school to college, big time and small time. Basketball is the headline grabber, but this time of year so many athletes are vying for titles. Hockey, gymnastics, wrestling, skiing, swimming and diving, rugby, cheer, baseball, track and field. It’s madness, and it’s here. You still have time to order a customized team necklace to show your school pride! Personalize with licensed NCAA logos, sports charms, hand-stamped team names and player numbers. Make it your own, but order soon! 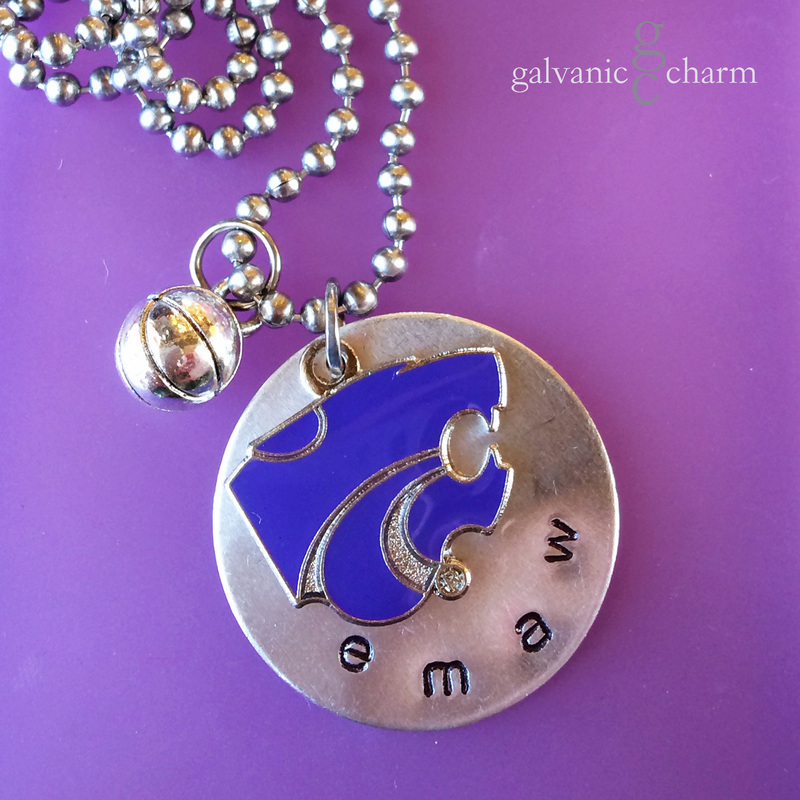 EMAW – Team necklace with 1″ nickel silver disc, hand-stamped with “emaw” in 3mm lowercase Gothic font. Pewter basketball charm and purple enamel Power Cat. Stainless steel ball chain. $30 as shown. Available directly or on Etsy. 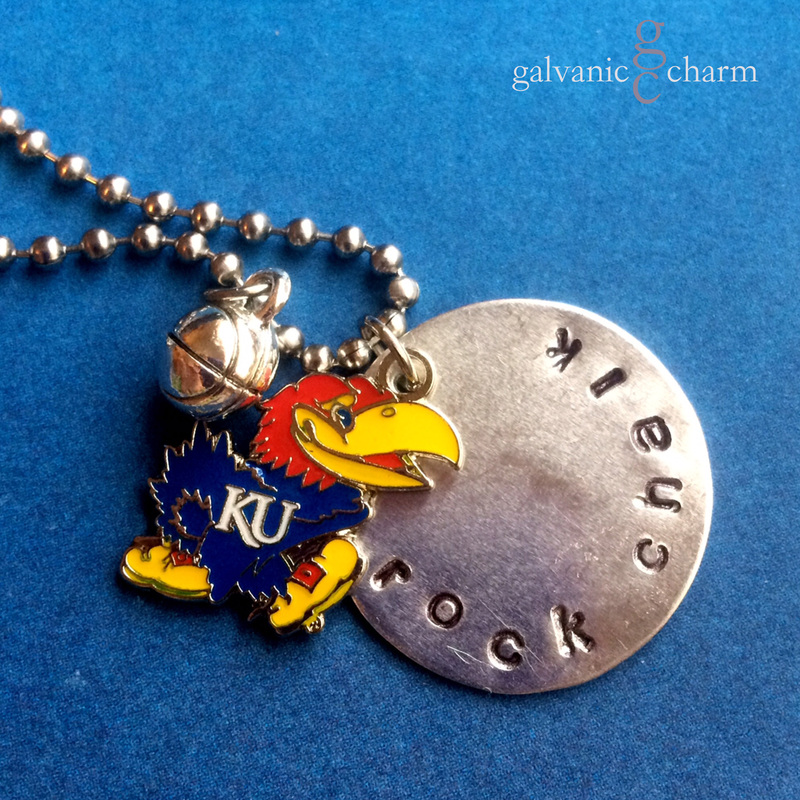 JAYHAWK – Team necklace with 1″ nickel silver disc, hand-stamped with “rock chalk” in 3mm lowercase Gothic font. Pewter basketball charm and blue, crimson, and yellow enamel Jayhawk. Stainless steel ball chain. $30 as shown. Available directly or on Etsy.